The Sprayway Heart Challenger 350 Junior Sleeping Bag is a sleeping bag with an elegant extra as it has a decoration of hearts and butterflies.The Sprayway Heart Challenger 350 Junior Sleeping Bag has the same quality of materials and range of features as the full-size versions of the Challenger range. This 2- to 3-season bag is designed for sleeping in on warmer UK nights.The double-layer construction with offset stitching effectively avoids cold spots developing as you move about in your sleep.The bag’s mummy shape means there is a smaller volume of air to keep warm around the feet. In addition, a fleece foot warmer at the far end makes even more sure that the child will not suffer from cold feet. Nobody would want to carry any more gear than necessary on an expedition. With the Challenger series, the hood features a tuck in it that you could fill with clothing to form a pillow rather than carry one or go without. In addition, the supplied stuff bag can also be filled with clothing or other suitable material and used for the same purpose.At the base of the sleeping bag there is a tuck pocket that can be used to keep keys and valuables for safe keeping overnight. The Sprayway Heart Challenger 350 Junior Sleeping Bag is made from quality materials and its innovative design offers warmth, convenience and fun for a youngster who needs a good night’s sleep to be ready for whatever the morning brings. Comfortable, dependable and value for money. 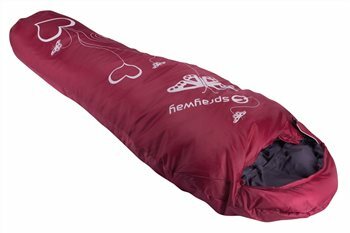 A fantastic all year round range of sleeping bags to cater for all shapes and sizes with alternating Inso/Therm polyester fill weights. The Inso/Therm is varied depending on your own particular warmth rating or how you feel the cold. Ranging from 450 fill for those very cold nights in spring and autumn, to a 250 fill for those fine summer evenings camping under the stars.